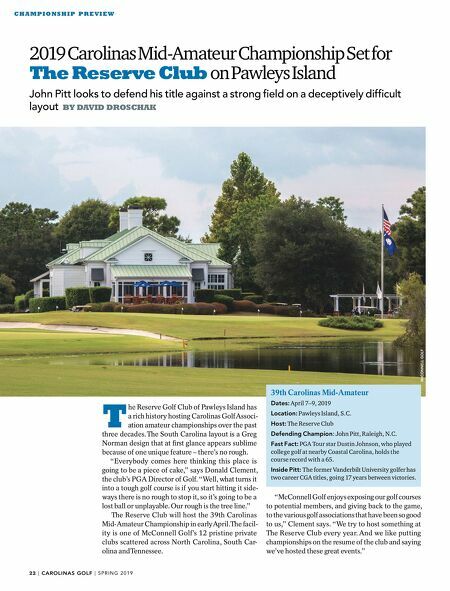 T he Reserve Golf Club of Pawleys Island has a rich history hosting Carolinas Golf Associ- ation amateur championships over the past three decades. The South Carolina layout is a Greg Norman design that at first glance appears sublime because of one unique feature – there's no rough. "Everybody comes here thinking this place is going to be a piece of cake," says Donald Clement, the club's PGA Director of Golf. "Well, what turns it into a tough golf course is if you start hitting it side- ways there is no rough to stop it, so it's going to be a lost ball or unplayable. Our rough is the tree line." The Reserve Club will host the 39th Carolinas Mid-Amateur Championship in early April. The facil- ity is one of McConnell Golf's 12 pristine private clubs scattered across North Carolina, South Car- olina and Tennessee. "McConnell Golf enjoys exposing our golf courses to potential members, and giving back to the game, to the various golf associations that have been so good to us," Clement says. "We try to host something at The Reserve Club every year. And we like putting championships on the resume of the club and saying we've hosted these great events." 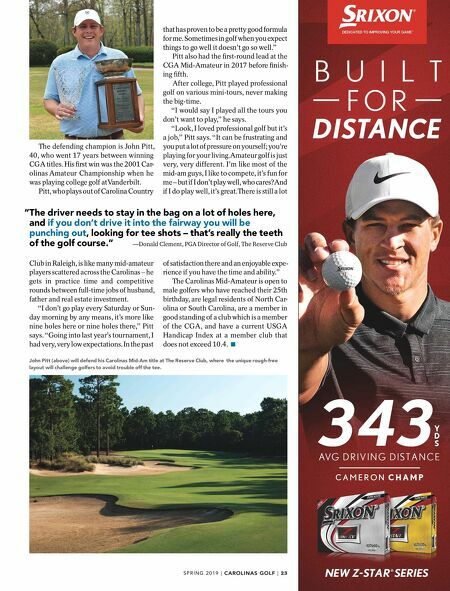 22 | | S P R I N G 2 0 1 9 C H A M P I O N S H I P P R E V I E W 2019 Carolinas Mid-Amateur Championship Set for The Reserve Club on Pawleys Island John Pitt looks to defend his title against a strong field on a deceptively difficult layout BY DAVID DROSCHAK McCO 39th Carolinas Mid-Amateur Dates: April 7–9, 2019 Location: Pawleys Island, S.C. Host: The Reserve Club Defending Champion: John Pitt, Raleigh, N.C. Fast Fact: PGA Tour star Dustin Johnson, who played college golf at nearby Coastal Carolina, holds the course record with a 65. Inside Pitt: The former Vanderbilt University golfer has two career CGA titles, going 17 years between victories.